This cake will be delivered in a sturdy cardboard box to the recipient. This cake will be garnished on top with fresh cream, sugar syrup, liquid chocolate as well as Strawberry fruit and other fresh fruits on top. The designing using all the toppings may vary a little from the image shown. The decoration items, cake stand and other accessories used in the image are just taken in use for representation purpose. These won’t be delivered with the cake. 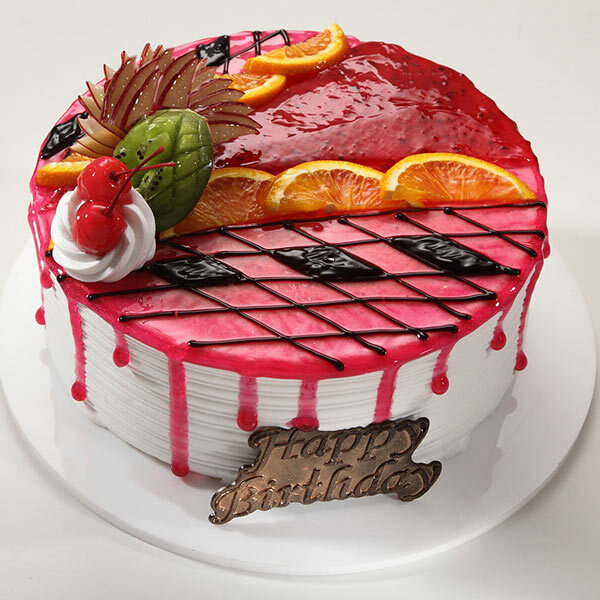 Make a choice for this lovely and colorful Strawberry Fruity Delight Cake that is baked with perfection and decorated with fresh fruit toppings, chocolate and sweet sugar syrup. Its one single bite is sure to give that much required treat to uplift your mood at once. Order it right here and delight all your loved ones during festivities or occasions of celebration. Beside yummy creamy topping and spongy bread base the major ingredients of this cake are flour, powdered sugar, baking powder, strawberry flavouring, eggs and more. One can also order for eggless version of this cake to enjoy it during occasions of merriment. All your loved ones like family, friends, wife or children on their birthdays. The occasion of your or your dear ones’ anniversaries. Everyone on special days celebrated internationally like Women’s Day, Valentine’s Day, Father’s Day, Mother’s Day, and others. Occasions like evening get-togethers, housewarming party, or festivals. We have an amazing team of baking experts that makes the best and freshest cakes with impeccable decorations. However, at times, there can be a minor difference between the delivered cakes and the shown ones as the cakes are prepared by different bakers having different baking and decoration skills. We offer a single time cake delivery services due to the perishable nature of cakes. Therefore, always provide a valid delivery address as your product cannot be redirected to any other location. The selected cake delivery date is just an approximation; everything depends on the cake availability and delivery address. We have opted for hand delivery of cakes as there is a high risk of damage if delivered along with other products. In case of unavailability of your desired cake, we either make a substitution or send a slightly different version of your picked cake in respect of its flavor and design. It is necessary to place cream cakes in the refrigerators to ensure longer preservation. Always store the fondant cakes in air conditioned areas and cut them with the help of serrated knives only. Do not keep cakes in high temperatures or sunlight. Always serve them at room temperatures only. The designer figurines or other components placed on the cake are supported by wooden skewers, metallic wires, or toothpicks. Always check for these supporters before consuming the cake. Consume the cake before 24 hours after receiving your order. Always keep the cakes away from the children’s reach. Have a good time relishing your delicious cake!! !